"Social Protest" by Julia Vogl - protest expressions from across the world. Anticorruption - Reading Research: Books, Reports, Surveys, Articles. As of March 7, 2019. Dirty Entanglements: Corruption, Crime, and Terrorism by Louise Shelley, (2014 - Cambridge University Press, 2014). Corruption, Contention, and Reform: The Power of Deep Democratization by Michael Johnston (2014 - Cambridge, 2014). G20 Anti-Corruption Action Plan 2019-2021. OECD Convention Against Bribery and OECD Corruption website. The OECD Working Group on Bribery. Financial Action Task Force - High Risks - Feb, 2019. The U.S. Foreign Corrupt Practices Act, 1977. London Summit - Communique - May, 2016. And, Declaration. Final statements by the United States, by the United Kingdom, by Nigeria, and by Afghanistan. 2016 IMF anti-corruption framework. 2018 Final IMF Framework. for general references to anticorruption information see the Partnership for Transparency Fund's project reports; Transparency International. OECD Secretary-General, March 28, 2018 - 2018 OECD Global Anti-Corruption & Integrity Forum: Planet Integrity: Building a Fairer Society. OECD on governance. Corruption, Greed, Culture and the State - Professor Susan Rose-Ackermann. Is The U.S. Giving Up On Supporting Democracy Abroad? - Thomas Carothers. Measuring Corruption - by Heinrich and Hodess. Guide to institutions measuring corruption and/or governance. International Corruption Defined - by Lawrence Lessig. The CPA-Zicklin Index benchmarks the political disclosure and accountability policies and practices of leading U.S. public companies. Global Integrity data: Africa Integrity Indicators; U.S. state integrity investigations; country information from the Governance Data Alliance. Colombia University Law School, Center for Public Integrity, U.S. state-by-state anti-corruption survey. Ibrahim Index of African Governance. Mo Ibrahim report on frican Justice & Transparency. World Bank - World Governance Indicators. Introducing/explaining the World Bank indicators by its authors. Institute for Economics and Peace: Global Peace Index 2018. World Justice Project: Rule of Law Index 2019. Freedom House: Democracy in Retreat - Freedom in the World 2019. Freedom House: Freedom of the Press 21017. TI Global Corruption Barometer 2017. Sir Paul Collier on New Rules for Rebuilding a Broken Nation - his TED talk. Commission on Fragile States 2018 - "Escaping the Fragility Trap." CIVICUS - Closing space for civil society - Overview 2018; and 2017 Annual Report. Closing Space: Democracy and Human Rights - Carnegie. 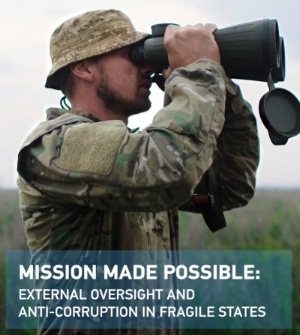 Transparency International Defense & Security reports: Understanding the relationship between corruption and security: The Fifth Column; Addressing Corruption Threats in International Interventions; in fragile states - Mission Made Possible. And, TI Global Standards for Responsible Defence. Peace and Corruption - Institute for Economics and Peace; and, the Global Terrorism Index 2017. Kleptocratic Regimes and National Security - conference report published by TRACC - also see news updates from the Terrorism, Transnational Crime and Corruption Center at George Mason University. SIPRI Year Book 2018 and SIPRI global arms spending data base. Andrew Feinstein -Corruption Watch UK - Shadow World and other Arms Industry Investigations. Integrity in State-building - OECD by Karen Hussman. Case example - Bahrain & Security, article by Jodi Vittori, Carnegie Endowment, 2019. CORRUPTION, HUMAN SECURITY, RIGHTS, JUSTICE, HEALTH, AID. Corruption as an International Crime Against Humanity - Ilias Bantekis. Prosecuting Corruption as an International Crime - GOPAC. The Case for an International Anti-Corruption Court - Judge Wolf. Fighting Grand Corruption: Challenges and Successes - Transparency International. Report of the International Crime Hunters Alliance - 2012, World Bank. Why Anti-Corruption Reforms Fail - Anna Persson, Bro Rothstein, Jan Teorell. Fighting Corruption to Advance 21st Century Health Goals - BMC Medicine journal 2016. Results Not Receipts - by Charles Kenny, Center for Global Development. Human rights & corruption - PTF forum event. Sextortion overview - also see website of the International Association of Women Judges. A Theory of Limits on Corruption - by M. S. Alam. Health - Seeking 21st century anti-corruption solutions. Pharmaceuticals - corruption report, YALE. Polarization in American politics - Professor James Thurber, Co-editor of "American Gridlock: The Sources, Character and Impact of Political Polarization," Cambridge. Corruption in America - from Benjamin Franklin's Snuff Box to Citizens United --author Zephyr Teachout, Harvard. Thomas Mann & Norman Ornstein - "Its Even Worse Than It Looks " Perseus Press. Senator Elizabeth Warren, 2018 - "Anti-Corruption & Public Integrity Act." US - HR.1. ethics in government proposed legislation January 2019, and civil society endorsements. US Justice - Indictment of Paul Manafort & Richard Gates. Carothers/Carnegie - U.S. Democracy at Risk. Issue One “Dark Money Illuminated” - 2018 report, U.S. political cash. See Center for Public Integrity reports - e.g. 2017 By the Numbers - Money and Politics. See Center for Public Accountability reports - e.g. U.S. corporate engagement in politics. Senator Bernie Sanders - Getting Money Out of Politics. Transparency International EU reports - e.g. INTEGRITY WATCH. EU study on corruption costs. Special EU Barometer - October 2017 - December 2017. EU Commission Anti-Corruption Report 2014. The Fight Against Corruption in Europe - GRECO- website - Council of Europe Convention on Corruption. Transparency International Report on “Golden Visas” 2018 and also other reports from TI Europe. Ukraine - 2014 in graphics/data - background article from The Economist. Looting Ukraine - report from the Lagatum Institute, July 2014. Breaking the Ukrainian Procuracy - by Will Pomeranz. "Putin's Kleptocracy - Who Owns Russia?" - by Professor Karen Dawisha, Simon & Schuster. February 2019, Constitutional Court Ruling - Ukraine. Countering Russian Kleptocracy and other reports from the Kleptocracy Initiative at the Hudson Institute. How the U.S. Can Combat Russia's Kleptocracy, Anders Aslund, Atlantic Council. * African Progress Panel 2013 report - an excellent analysis of causes of absolute poverty in the resource-rich countries of sub-Saharan Africa. * African Barometer 2015 - a comprehensive survey of the impact of corruption on Africans. * Corruption: Myths & Realities by Ngozi Okonjo-Iweala at the Center for Global development, June 2007. * Return of the Blood Diamond - Global Witness updates its landmark investigations. * The Resource Curse - an analysis of the real costs of extractives. * Egypt: Background and US Relations - US Congressional Research Service. * Nigeria - Sarah Chayes of the Carnegie Endowment analyzes corruption and security – also see Boko Haram. * Africa Between Hope and Despair - by David Piling, Financial Times, 2016. *Genocide - Review of the 2016 book by professor Scott Straus. Iraq - hard Lessons from reconstruction experience - the 2009 report from the US Special Inspector General. Learning from Iraq - final reconstruction report. Afghanistan - April 2016 speech by the Special US Inspector General. Afghanistan - Testimony to the US Congress by the Special inspector General, April 2016. US Special Inspector General's 1st Quarter 2016 Afghan report, and its April 2018 special report on the World Bank and Afghanistan; and website. Corruption in Conflict: lessons Learned from the U.S. Experience in Afghanistan - a report from the U.S. Special Inspector General for Afghanistan, September 2016. Culture, Corruption, Crime, and Conflict - Eric B. Johnson, Transnational Crime and Corruption, George Mason University. SIGAR - updates on Afghanistan corruption. Independent Joint Anti-Corruption Monitoring and Evaluation Committee, regular reports, MEC Afghanistan. PTF's CARTA Program for monitoring development in Nepal and Bangladesh. Also see CARTA web. Citizens Against Corruption - India - PTF. *See annual corruption survey and annual Afghan survey, as well as other anti-corruption research at The Asia Foundation. Understanding President XI's anti-corruption drive in China - The Conversation. Perspectives on corruption in Bangladesh - see TI reports. Malaysia's 1MDB scandal - the U.S. Justice Department's case. * 2016 Middle East Barometer - Transparency international. * The Natural Resource Governance Institute: The Resource Curse. - also see the 2017 INDEX. * "Blood Oil" - book review. * Saudi Oil - A Financial Times analysis 2016. * The Political economy of Natural Resources - Paul Collier. Guatemala Report - Center for American Progress - a case study on promoting prosecution of corruption crimes in a very difficult environment. The International Commission - Guatemala - an analysis of what has been achieved by the International Crisis Group. When Corruption is the Operating System: The Case of Honduras - Sarah Chayes. How the Odebrecht scandal has shaken Latin America - an FDI report. The U.S. Department's case against Odebrecht. The Trial of former Peruvian president Fujimori. Latin America Under New Management - report from The Financial Times. video - Brazil's Judge Moro at the Wilson Center's Brazil Institute, July 2016. Argentina’s Reform Challenges – CSIS reports. Mexico’s Corruption Crisis – The Wilson Center. Inter-American Dialogue - "Beyond the Scandals." Illicit Financial Flows - report from Global Financial Integrity. TI-UK "Paradise Lost" and "Safe Havens." The Costs of Luxury - Global Witness. US National Money Laundering Risk Assessment 2015. TI overview report on Integrity in Banks. US Senate report on HSBC and money laundering and see at website the US Republican House Financial Services report on "Too Big to Jail." Financial Transparency - Raymond Baker, GFI President. *Eliminating Large Denomination $ and Euro notes - Peter Sands. Keeping Foreign Corruption Out of the United States - 2010 Report from the US Senate's Committee on Investigations. Tax Abuses and Human Rights - the International Bar Association. Grave Secrecy - Global Witness. Keeping Foreign Corruption Out of the United States - report by U.S. Senate committee and Opening Statement by Senator Carl Levin. HSBC and Dirty Money - International Consortium of Investigative Journalists. Global Anti- Money-Laundering Survey 2014 - KPMG. Global Witness "Undercover" investigates lawyers in New York City - excerpts of this film were shown nationally in the United States on the CBS "60 Minutes" show. The "Volcker Report" on the World Bank's anti-corruption performance, 2007. Removing Impediments to Sustainable Development - by Augusto López Claros. Notes from US Media 2016 on Executive Pay and Average Pay. World Economic Forum - Building Foundations Against Corruption. The arms trade - video with Andrew Feinstein. * Global Corruption Report -2016 - Transparency International. 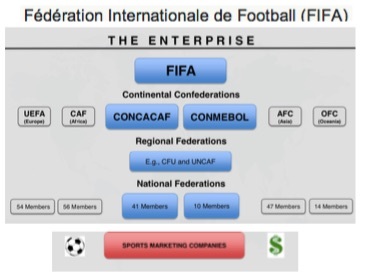 * The US Department of Justice prosecutes FIFA. * OECD - Multistake Task Forces Established. Also see Europol. U.S. Department of Justice, May 2015. For topical articles on many of the above topics please see "blogs" on this website.